Update 2014-09-10: Hearing is completed and we're working on a full write-up. We'll look to post a link to the archived video when it's available. The Planetary Society's President, Dr. Jim Bell, will make the case for stronger investment in planetary science before a congressional panel on Wednesday. Make sure to tune in to a live-stream and support Dr. Bell at 10am EDT on September 10th. The hearing before the Space Subcommittee in the House of Representatives, Exploring Our Solar System: The ASTEROIDS Act as a Key Step, will focus on the health and future of NASA's planetary exploration program, as well as examine the ASTEROIDS Act, which would grant ownership rights to resources extracted from asteroids and other bodies. Dr. Jim Green, Director, NASA Planetary Science Division. He will likely give a broad overview of the current planetary exploration program as implemented. As an employee of the Administration, he cannot criticize any Administration positions. Dr. Mark Sykes, CEO and Director, Planetary Science Institute. The Planetary Science institute is an organization of professional planetary scientists that depend on government grants for their funding. He's also an expert on asteroids and other small-bodies in the solar system. My guess is that he will focus on recent declines in research funding. Joanne Gabrynowicz, Professor Emerita, Director Emerita, Journal of Space Law Editor-in-Chief Emerita, University of Mississippi. Property rights for asteroids are tricky since they stray into significant amounts of international law and treaties She is a space law expert and will likely speak about the legal framework for the ASTEROIDS Act. Dr. Philip Christensen, Co-Chair, NRC Committee on Astrobiology and Planetary Science (CAPS), Chair, Mars Panel, NRC Planetary Decadal Survey, Regents Professor, Arizona State University. 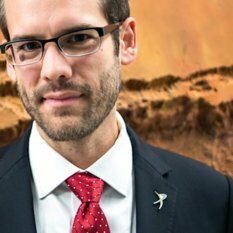 Dr. Christensen will likely discuss how NASA's current plans follow (or don't follow) recommendations made in the Decadal Survey for planetary science. It's important to understand the importance of what's going on here. Thanks to continued, focused, and consistent advocacy by The Planetary Society and our partners, the state of the nation's planetary exploration program is getting a lot of focus by Congress. And not during the slow days of summer, either, but within a busy September just months before the elections. I'm very pleased that the Space Subcommittee is raising awareness about this issue and the potential legal requirements for asteroid mining. Let's hope NASA and the White House see the support for NASA's space science and decide to request appropriate funding for them (and a mission to Europa!) in 2016. 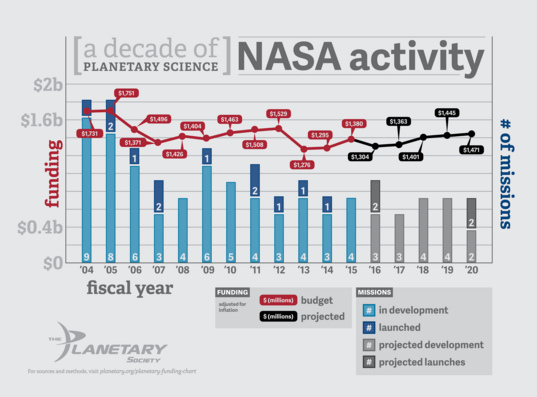 Funding for planetary exploration at NASA mapped against the number of missions in development, adjusted for inflation and for programmatic consistency. Current as of the FY2016 President's Budget Request.